Of the many restaurants I have been to in Boston, there is one that I have amazing memories of. Not because I know the chef Gabriel, although this surely helps, especially when you have dinner in his restaurant with his girlfriend who happens to be herself an amazing known chef in the US. 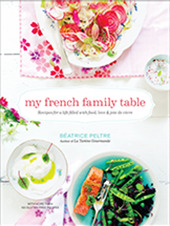 Yes, she was voted America’s Best New Chefs 2000 in Food and Wine magazine. Pas mal, non ? The restaurant is called Spire, and is located at the Nine Zero Hotel in Boston. But Gabriel does not work there anymore (in case you wanted to rush to the place). However, on his last night at the restaurant, we were lucky to have booked a table with Amanda Lydon, his girlfriend, and some of our best friends. And mince alors, we were spoiled! We chose a tasting menu (menu dégustation), and food just kept coming and coming our way. Dinner included about 8 courses or so (I stopped counting at some point), with wine (and I even forget how many glasses there were on the table). And it was simply amazingly good food. I could decide to tell you all about the different courses we had, but it would take me days, and I think you might just give up before the end of my story. So instead, I will just focus on one mise-en-bouche we had. With a rich creamy texture, white in color, a little tart, but soft at the same time. I was imagining milk, cream, or a similar ingredient. In my mind, I really thought “dairy”. “Nope,” Gabriel replied. “Neither milk nor cream. The soup is a white gazpacho made with bread and almonds.” “Vraiment ?” “Yes, really!” That was just enough to tickle my curiosity and make me want to make it. But chefs are busy people, and to be able to get the details of a recipe from them, right there? Forget about it! Impensable ! (unthinkable) The good surprise came a few weeks later, when I saw an article in the food section of the Boston Globe that was featuring Gabriel’s recipe. Bingo! I had it! I have had the recipe for quite a while now and had almost forgotten about it, until last week when I attempted to organize my cookbook bookcase. Et dire que je croyais l’avoir perdue ! (I even thought I had lost it!) I read quickly through it and decided that the time was finally right to try my hand at this intriguing gazpacho. Not difficult to make, by any means. Successful in the outcome. Would need to be served in small portions as a mise en bouche. I had to adjust a few things, however, including only adding half of the water suggested in the recipe. I wondered whether this was due to a typo in the listed ingredients or simply because of the type of bread I used. I will only know when I try it again, next time. Before then, I would simply suggest that you add the water gradually and check the consistency as you go. The soup should not be nor too thick nor too liquidy. Note that I also added the vinegar gradually and suggest you do the same. It all depends if you like when a dish is really tart or not. I love vinegar so I used it all. Use your own assessment. You are the best judge. I changed the garnish suggestions from the original recipe to what is above. In a bowl, combine the bread cubes with enough water to cover it. Set aside. In a food processor, combine the almonds, garlic and salt. Mix until it is smooth. Squeeze the excess water out of the bread cubes and add the bread to the preparation, in the food processor. Mix well until it forms a paste. While the food processor is on, add the oil in a thin, steady stream. Then add the vinegar and the water. Pulse until the preparation is smooth. For the garnish, dry toast your walnuts in a frying pan. Cut the tomatoes in tiny cubes. Place a ladleful of soup in bowls or small shot glasses, and add some garnish with a dash of olive oil. Note: To blanch almonds, simply boil them for a few mns, then press gently on them. The skin falls on its own. J’ai changé la garniture par rapport à la recette d’origine à ce qui est suggéré ci-dessus. Mettez les cubes de pain dans un grand bol et versez de l’eau pour couvrir le pain. Mettez de côté. Dans un robot, mélangez les amandes, les gousses d’ail et le sel. Réduisez en purée jusqu’à l’obtention d’une consistance lisse. Pressez le pain entre vos mains pour enlever l’excès d’eau. Mettez-le dans le robot. Mixez pour obtenir une pâte. Tandis que le robot est en marche, ajoutez l’huilesous forme de petit filet constant. Puis, ajoutez le vinaigre et l’eau. Pulser pour obtenir une préparation lisse. Pour la garniture, faites dorer vos noix à sec, dans une poêle. Coupez vos tomates en petits dés. Versez une louche de gaspacho dans des bols ou des petits verres, et ajoutez la garniture avec un soupçon d’huile d’olive. Remarque : Pour blanchir des amandes, ébouillantez-les pendant quelques minutes et pressez-les entre vos doigts. La peau “tombe” toute seule. Bea- these are beautiful! I love the idea of a gazpacho alternative, and the almonds sound wonderful. I love the whole idea! remember, the tomato was a “recent” import to the Continent from the New World, so all things that we normally associate with ‘maters were originally made without them, gazpaacho and pasta sauce included! apparently Gazpacho is THE food of Summer 2006! Very unique to me but I do love almonds. Unique but I really enjoy almonds. Photo magnifique comme d’habitude. Béa, tu es une référence pour moi en matière de composition photographique! Quelle bonne idée: c’est si bon les amandes!! Yummy! what a beautiful spin on gazpacho. Sounds like you had a wonderful dinner! kind of reminds me of vischysoisse (sp? ), but any cold soup is just fine with me!! your soup looks refreshing! Mmmm yum, looks full of goodness Bea! très original ma foi ! et quelles photos!!! excellent j’étais partie à Madrid le temps de lire ton post. excellent! je ne suis pas fan des tomates dans le gazpacho, alors je prends volontiers cette version amandes si originale! 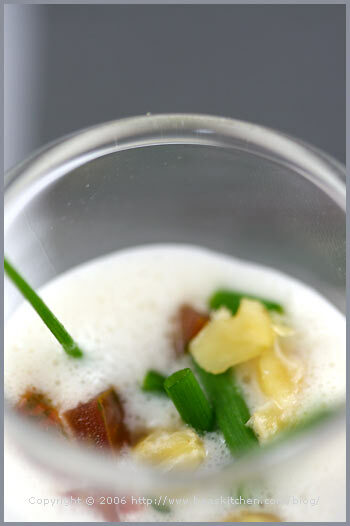 hi bea, fabulous white gazpacho – just the cool soup for sweltering days…very beautiful pictures too! Beautiful. Looks particularly refreshing on these incredibly muggy days. I do love the idea! Thank you so much for the recipe Bea! AFter your description of Spire I was eager to give it a try, but hesitated after finding out that Gabriel left. But now I can get a taste of his creativity with this recipe thanks to you. ooo, this looks so delicious. what a beautiful pictures! perfect for a hot summerday. and what about for a party? it looks so chique with that garnish! L, thanks so much. Very pleased to hear you like it. Hope you try it! Ann, ah yes you are right. It seems like gazpacho and cold soups are just the food of the summer! Mais en fait, du sel de mer peut très bien faire l’affaire. Jeff, it is indeed, thanks. Ninnie, merci de ton gentil mot. Je suis heureuse que je peux t’inspirer! Jenjen, yes it was quite nice I have to say 😉 Memorable. Kat, yes any cold soups these days. Anne, ah super, Madrid, tu nous concoctes des plats espagnols j’espère. J, thanks totally right. Days like the ones we have right now only call for cold easy to eat foods. Eggy, thanks. I am with you! Helen, ah yes, I wonderif the quality at Spire changed. I should give it a try or ask who is the current chef there? An intriguing recipe. My hubby and do not like regular gazpacho. So I commissioned him to try and make a gazpacho that actually tasted good and he came up with something that was somewhat better. For one thing instead of having bread in it, it had croutons on top. Well, that’s the fun of it all is making food that you’ll like to eat. Beautiful presentation, Bea! I’ve never had gazpacho as yet. Cold soup hasn’t interested me. Until now. 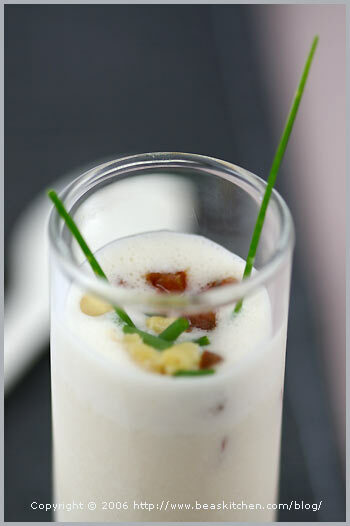 The Almond Gaspacho sounds trully enticing. That’s simply exquisite, Bea. You’re so right, gazpacho doesn’t have to contain tomatoes. This would be such a lovely thing for a party. Thanks. Very interesting Natalie. Curiosity leads to good things! Stéphane, très bonne idée ! Mae, oh you have to try!!! You will love it! Sher, you are totally right! 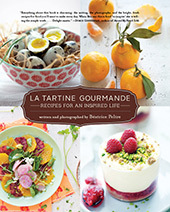 ok,it is all good and fun (c’est bon et marrant) but WHY call it gazpacho and not “foie gras vert”? You would need to ask the restaurant chef where I tasted this dish. mes félicitations, votre blog est excellent. c’est un plaisir de lire vos textes, vos recettes et de voir les photos. oui, cette soupe froide est une recette d’origine espagnole, (comme moi, bien que j’habite au portugal). nous l’appelons “ajoblanco” (ail blanc) et elle est fort appréciée en été, tout comme les autres gazpachos andalous, dont les recettes diffèrent selons les régions. le “ajoblanco” est originaire de la région de malaga. la recette est semblable à la votre, mais la soupe est normalement servie avec des raisins blancs ou des petites boules de melon. je vais essayer votre version. 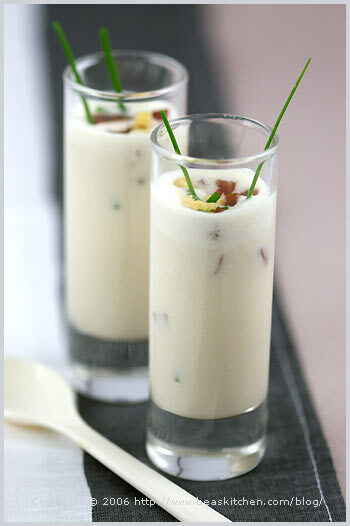 What size shot glasses do you recommend for an Amuse Bouche? Behövde blir 62 år innan jag fick smaka på detta underbara i Marbella. Där fick jag receptet “på ett ungefär” så det var perfect att hitta dtt exacta. Stort tack, mina gäster kommer säkert att tacka också.